Subscriptions offer publishers, online and print, vital information. Knowing your subscriber base means knowing your audience and its size. Subscriptions offer digital and print publishers vital information, such as audience size and demographics. 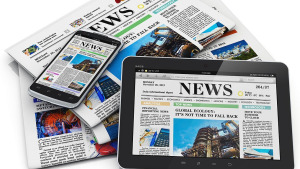 It is a model online news publishers are likely to lean on more in the future. media update’s Adam Wakefield peers into the past, present, and future of online publishing, and the value of the subscription model. Prior to the Internet, publishers pursued a mixed model of subscriptions, single sale copies, and placed advertising. However, as noted by content recommendation platform Bibblio on Medium, newspaper publishers broke from this mixed revenue model and relied exclusively on advertising for “their own survival”. Bibblio called the decision to move away from that mixed revenue module a “moment of madness”. However, the increasing dominance of Google and Facebook within the online advertising space has seen publishers competing for a shrinking piece of pie. According to eMarketer’s 2017 report, titled Beyond the Duopoly: Exploring Digital Advertising Outside Google and Facebook, the two companies will control 63% of all online ad spend in the United States in 2018. In the United Kingdom, Google and Facebook accounted for 54% of the digital advertising market in 2017. According to Frederic Filloux, editor of the Monday Note, the New York Times has shown the difference subscribers can make on average revenue per user (ARPU). The New York Times’ ARPU, based on paying subscribers, is USD 140. This is compared to Buzzfeed’s ARPU of USD 1, which relies on an unpaid model and advertising. The New York Times’ advertising ARPU is only USD 3, while Facebook’s and Google’s are USD 62 and USD 77 respectively. Put another way, the revenue produced by The New York Times’ digital subscribers is 46 times higher than the publications advertising revenue, spread across its entire audience. “While precise figures have yet to emerge, many news organisations that rely on subscriptions feel the same trend. From Brexit to Trump, the rise of populism favours a flight to quality information,” Filloux says. Viewed from a branding perspective, as noted by WE Communications’ president of international and WE+, Alan VanderMolen when speaking about the firm’s Brands in Motion study, brands can provide stability in uncertain times. This is a niche news organisations can fill. Any consumer purchase has a value proposition decision at its heart. The consumers online publishers aim to reach are no exception. According to Henriëtte Loubser, editor of Afrikaans news portal Netwerk24, readers who are willing to pay for their content understand that it is the same content they have paid for in print for decades. They know that original “on the ground” reporting is expensive, and cannot be funded by advertising alone. “Netwerk24 is rooted in its market. The journalists who previously produced copy for Die Burger, Beeld, and Volksblad have all moved to Netwerk24 and now produce copy digitally first,” Loubser says. Readers know that the journalistic principles that guided the print publications to produce first-hand, quality, in-depth reporting remain in place with the digital product. “This is why Media24’s newspapers have always had cover prices, and why it is still needed in the digital era,” she says. Readers are therefore helping Netwerk24 build a “future for original Afrikaans journalism”. Loubser also cited the success of The New York Times, and Washington Post, among other platforms in the English-speaking world, as examples of how a subscription model can succeed. By the end of December 2017, Netwerk24 had 28 535 subscribers. Subscriptions grew by 15% in November and 6% in December. Lisa MacLoed, head of digital at Tiso Blackstar Group, home of BusinessLive, which uses a hybrid freemium subscription model, says BusinessLIVE's pricing has been set according to reader research. High-quality premium local and international content is available for paying subscribers, while a 'steady stream' of content is provided for those who cannot pay. “BusinessLIVE is a freemium model, and is still 80% free, with only 20% paid-for content, providing up to 200 stories a day. Access is free for print subscribers. We also provide discounts for pensioners, and we’re looking at alternative models to reach the student market,” MacLeod says. As important as it is to attract new subscribers, retaining existing customers is also critical in maintaining a predictable revenue stream. Loubser says Netwerk24’s paywall was introduced after Media24’s decision to consolidate their individual Afrikaans print titles’ websites into Netwerk24. Initially, it functioned as a metered paywall, with 10 articles available for readers to read for free a month. It later evolved into a solid paywall in June 2016, where subscribers have 30 days all-access, and then had to choose either the digital-only option or digital plus, which includes physical home delivery of a Saturday edition of the newspaper of their choice. Full week subscribers to Beeld, Die Burger and Volksblad have all-access to Netwerk24. Magazines were added to the Netwerk24 bouquet in November, giving readers extra incentive to subscribe. Loubser says subscribers must be given a unique offering, which is value for money that they cannot get elsewhere. “This certainly is the case with Netwerk24 housing the daily newspapers, Rapport, 11 magazines, and more than 30 community newspapers all in one place, whilst also providing users with fresh breaking news and analysis as it happens 18 hours per day, 7 days per week,” Loubser explains. It is a new year, and the media will continue evolving. Read more in our article, Four predictions for South African media in 2018. Image courtesy of Sollok29, under this license.